All photos courtesy of Hotel Theodore. 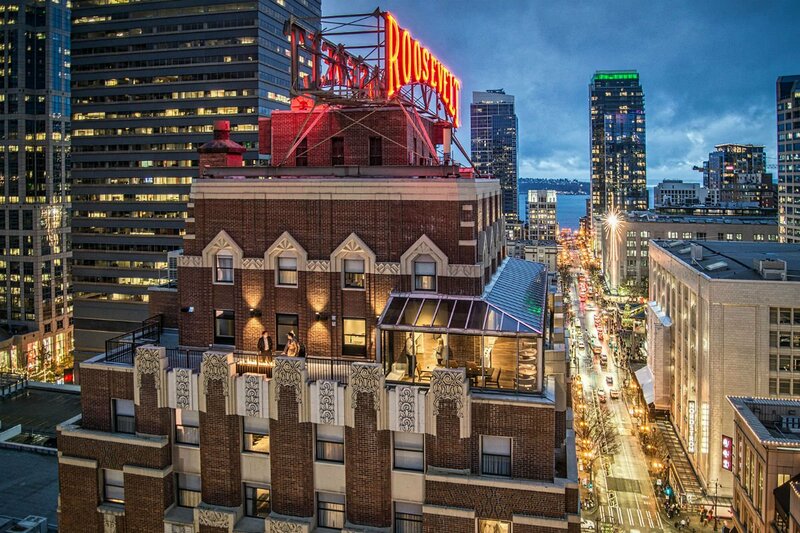 Bask in the ruby neon glow of the iconic Roosevelt sign at Hotel Theodore, a downtown Seattle landmark reborn. 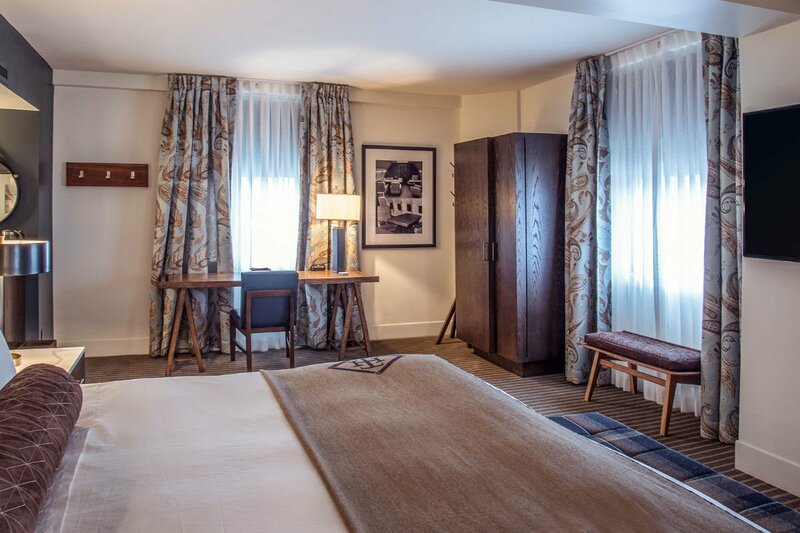 Once the historic Roosevelt Hotel, the 1930s Art Deco treasure hides a contemporary, luxury stay steeped in Seattle history. The hotel remains as upstanding as its namesake. 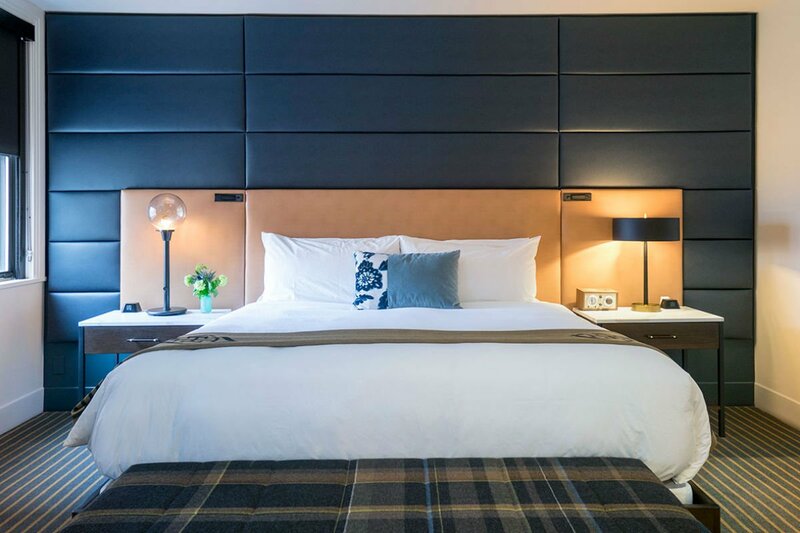 Navy blue features, tufted tan leather headboards, and crisp white linens evoke an elegant and soothing gentleman's quarter, minimalist styling that encourages a tranquil break from the busy city center. You might have thought you knew the Roosevelt Hotel, but Hotel Theodore invites you to get on a first name basis. 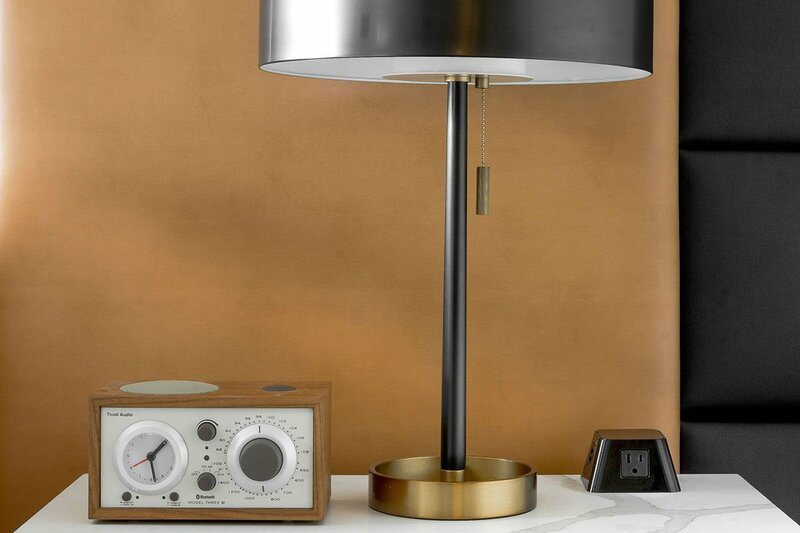 Vibe: Understated, minimalist interiors provide a relaxing setting. Standout Detail: Round-the-clock sugar hits. 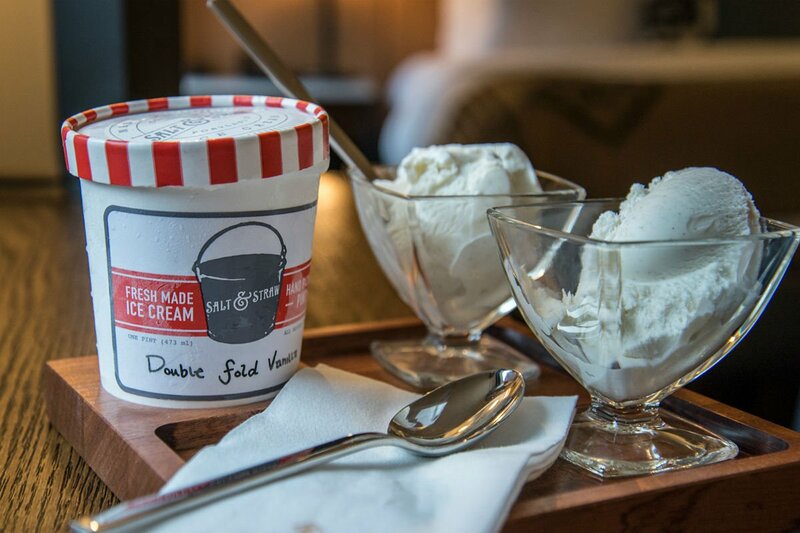 Sweet-toothed guests can have an imaginative ice cream midnight snack from cult scoop shop where flavor combinations include Elm coffee with Westland whisky and Beecher’s cheese with peppercorn toffee, thanks to 24-hour room service. This Place Is Perfect For: The elegant couple who appreciates mixing virtue (exercise) with vice (ice cream). While children are welcome, the hotel is more suitable for older kids. Rooms: The 153 rooms includes sixteen suites and a 20,000-square-foot penthouse on the 19th floor known as The Residence, featuring two wraparound decks and a multimedia room. The understated, Scandi0-style decor extends to the white subway tiles and matte black fixtures in the bathrooms, which are filled with Imperial Barber bath amenities. Partake of the locally influenced honor bar, in-room Nespresso machine, and Tivoli bluetooth music radio. Suites come with clawfoot tubs and a pair of Freeman rain jackets for rainy Seattle days. Request the Provenance Well + Fit Kit and have a wrapped Manduka yoga mat, set of Barre3 bands, weights, and signature core ball, and an iPad with over 300 preloaded Well + Fit fitness videos delivered right to your room. On Site: The second floor fitness center is top-of-the-range (see: Peloton bikes), but if that doesn’t motivate you, the hotel partners with local studios to provide guests with access to BurnCycle, CorePower, The Lab, and barre3 classes on the house. In-room beauty services from local professionals are available through . 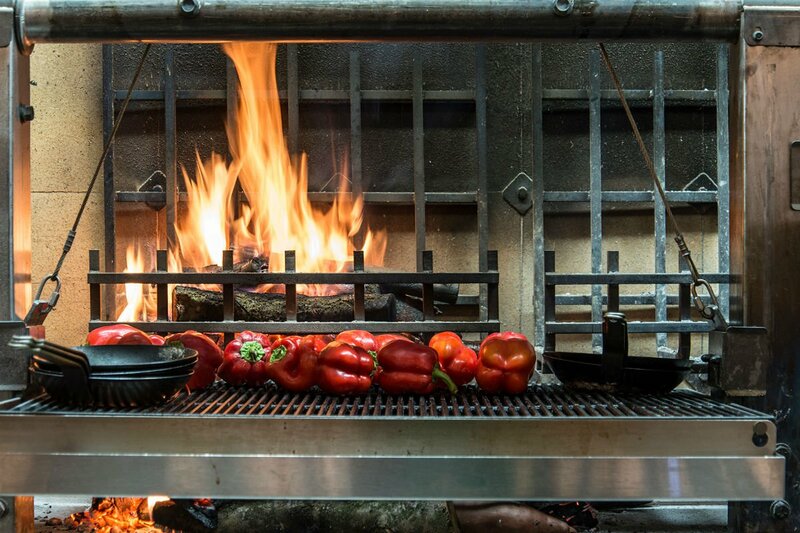 Food and Drink: is a classic surf-and-turf restaurant that celebrates Seattle’s unique merging of forest and ocean. The menu is also available in-room 24 hours a day. 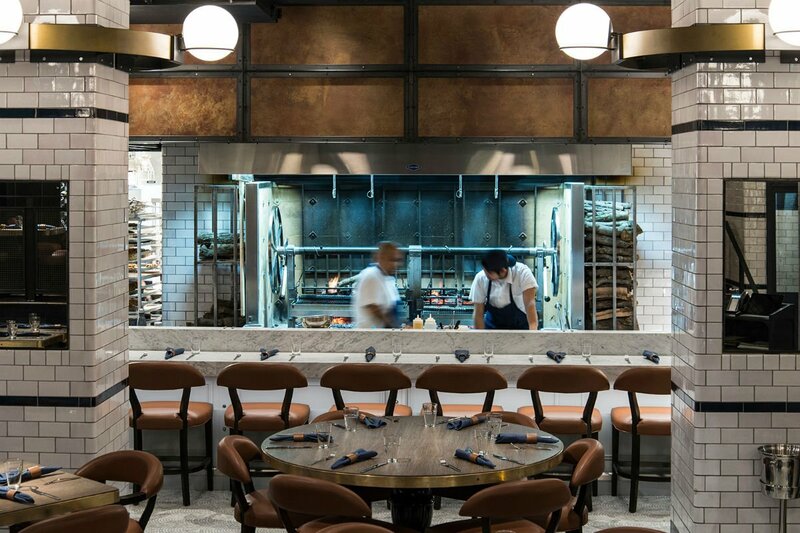 The open kitchen and grill make it a dining experience with a show, and guests can get closer to the action by booking a seat at the marble chef’s counter. Just off the lobby is the inviting with floor-to-ceiling windows and a fireplace. Commitment to coffee runs deep here: They roast their own beans in a 1949 Balestra wood-fired roaster. 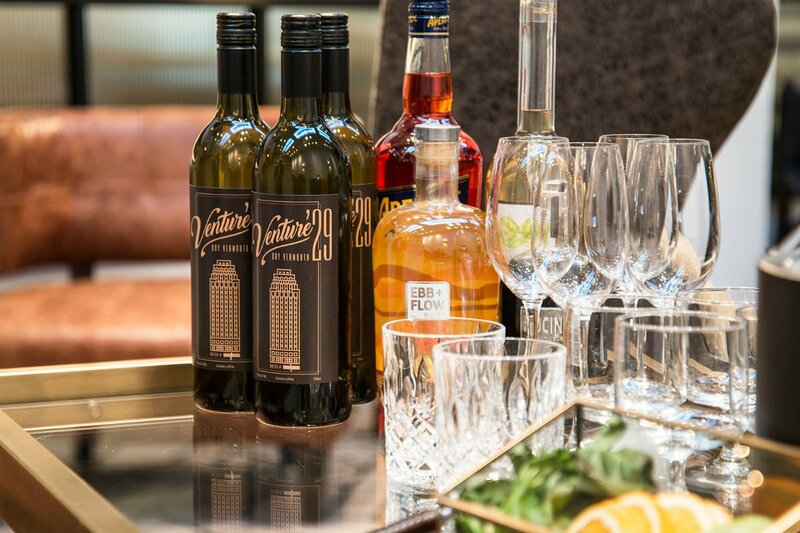 Aperitivo hour takes place daily in the atrium, where complimentary beverages feature distills from experimental Washington locals . Rates change seasonally and typically start at $249 depending on the room type. . Or get in touch with the Popupla Concierge, and we can plan your trip for you. While the menu at cafe and bar provides hearty, fresh flavors around the clock, it’s an especially great breakfast venue. Nail Seattle’s casual chic, denim-and-silk style with a visit to , and stop for an afternoon sugar hit at nearby . Historic spans nine acres of farm stands, buskers, and European bakeries, with eating options for every palate. Visit in the early evening for house-aged cocktails and custom distills at before heading to for Middle Eastern eats, tempting cocktails, and rooftop views of the city.